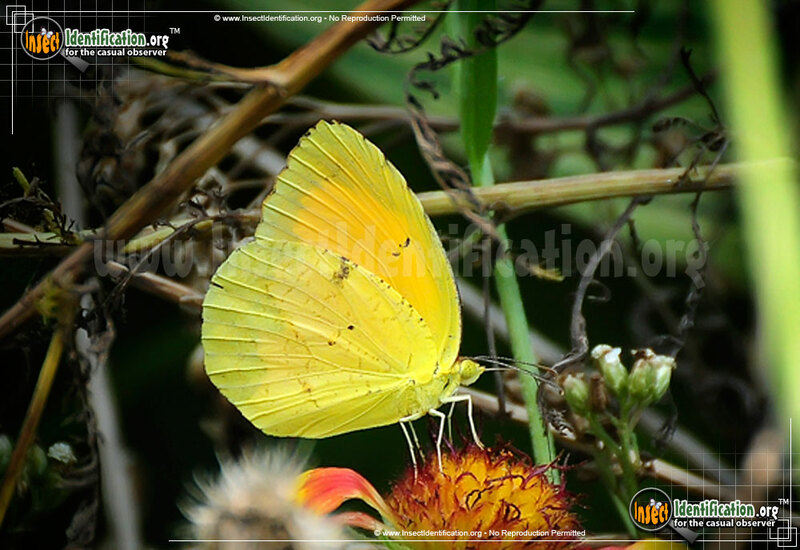 Detailing the physical features, habits, territorial reach and other identifying qualities of the Sleepy Orange Sulphur. The slow-flying Sleepy Orange Sulphur seems to float about in a daze, enjoying the warmer regions of the continent. The sleepy part of the Sleepy Orange Sulphur may refer to its drowsy appearance in flight. It may also have something to do with the 'closed' dot on the top of the forewing. When the wings are open flat, black borders are obvious. Less noticeable is the small black crescent near the upper edge of each forewing. In many other Sulphurs, this mark is a solid black dot. This crescent shape resembles a closed eye without eyelashes. The Sleepy Orange is indeed yellow-orange. The underside of the wings are covered in brown-red markings that look similar to a network or veins or capillaries. These markings are darker during winter in the southern part of its range. In addition to these fine lines, three thicker brown bars are spread throughout the middle area of the forewing along with two small brown dots near the bottom edge of each wing. In the warmer south, the Sleepy Orange is active all year. In the cooler northern states, activity ends in autumn. Adults drink nectar from flowers. Larvae eat from plants in the Senna and Cassia family. Caterpillars are green and fleshy with a single white line along the bottom edge of each side. Look for flying adults in open fields and lots, along the roadside, and in desert brush.